Researchers have completed research on the development of wind speed measuring tools based on Adobe Audition 1.5 in innovation and implementation of scientific physics. The purpose of this research is to get a calibrated wind speed measuring instrument, valid, and have good feasibility. The method used was an experimental method, that is designing, making, calibration, and validation. The results reveal that the tool made is well calibrated. The calibration results indicates that the tools is very well, with a fault tolerance of 1.77%. Based on the result of feasibility test by two validators, it is obtained score of 100 which means the tool made is very feasible. Azlinaa, M., & Takdir, T. (2013). Pembuatan Alat Ukur Kecepatan Angin dan Penunjuk Arah Angin Berbasis Mikrokontroller At-mega8535. Saintia Fisika, 6(1). Salim, M. Barkah dan Moh. Toifur. (2012). Pemanfaatan Sensor Induksi Untuk Menentukan Tingkat Kekentalan Cairan Dengan Menggunakan Adobe Audition 1.5. Surabaya : UNESA. Suprianto, T. (2011). 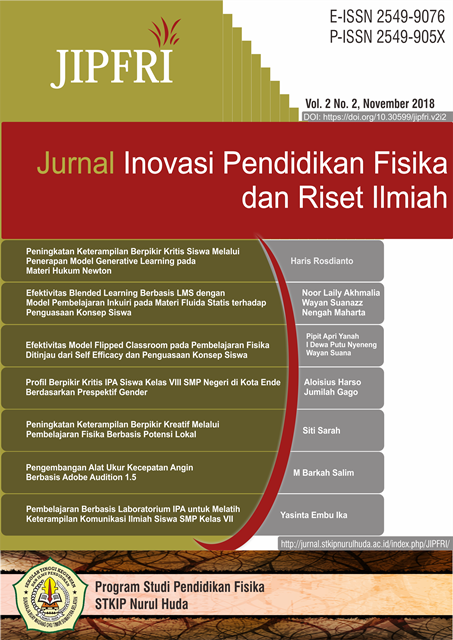 Panduan Teknis Perwatan Peralatan Laboratorium Fisika. Jakarta : Kementerian Pendidikan Dan Kebudayaan.